You should know… We’re not offering advice simply as dentists, hygienists or dental care professionals. We’re parents! We are all practicing these very tips with our kiddos who range in age from 6 months to 18+ years so we are currently or have been there. We know it’s a struggle to teach the importance of oral hygiene to our children who JUST WANT TO HAVE FUN. We also know that children beam with pride when they visit the dentist and do not have “sugar bugs” on their teeth! We want to encourage that feeling for them and encourage parents who are doing so much to raise healthy, happy children. Let’s address the questions we receive in the office all of the time from concerned parents. WHEN should I take my baby to the dentist and WHAT will they do? We suggest bringing your child to the dentist when they have teeth OR by their first birthday, whichever comes first. This exam will be short and simple with what we call a “Lap Exam.” You’ll hold your little one while the doc gets a peek inside their mouth to see that their teeth are growing in healthily, their gums look pretty and pink and there aren’t any issues that need to be addressed such as excessive bottle use or other habits that can cause concern. HOW and WHEN do I begin brushing my kid’s teeth? We recommend you introduce tooth brushing early and progress as they do. You might start by wiping your infant’s teeth with a clean wet rag after they try a messy meal. We also love THESE fun toothbrushes. There are a variety of baby toothbrushes, some that slip right over your finger so you have control and some even come with a fun story to teach your kid about oral hygiene! As your baby becomes a toddler, there will be plenty of teeth to brush. You’ll want to establish healthy habits – brush twice a day – and start flossing when their teeth touch. WHAT is the proper brushing technique I should teach my child? Samantha is one of our lovely hygienists and provides patients with education about their oral hygiene, proper techniques, products and all the fun tooth care advice. Our video BELOW shows how to brush your teeth and might be helpful to share with your youngins so they understand. It’s also a good reminder for adults so click and learn! WHY does it matter if my kid has good oral hygiene if they’re losing their baby teeth anyway? It matters tremendously! There are a couple of reasons. #1. Habits are very hard to change. If a child goes years without establishing healthy oral hygiene habits, chances are they will not start have these important skills as adolescents or adults which lead to a variety of oral and overall health issues. #2. If cavities progress on baby teeth and are left untreated, there is a high risk of the adult teeth becoming infected, thus destroying their adult teeth before they’ve even erupted. It is imperative to teach and provide healthy oral hygiene for our kids so they are set up for a lifetime of dental success. Thirdly – it is no secret that people fear the dentist. The most common comment we hear from fearful patients is that they had a bad experience at the dentist as a child. We want to change this for the next generation! We want them to sit confidently in the dental chair and leave with a broad smile and silly toy at each visit. We want them to grow into adults who don’t fear the dentist, but look forward to that fresh clean feeling they get every 6 months and face dental work without fear of the dentist. We are blessed in Ellensburg to have Central Washington Pediatric Dentistry who specializes in seeing the kids in our area. We at Mountain View Dental Center are also pleased to see your children and have many families who like to come together from young to old and share the dental experience as a family. 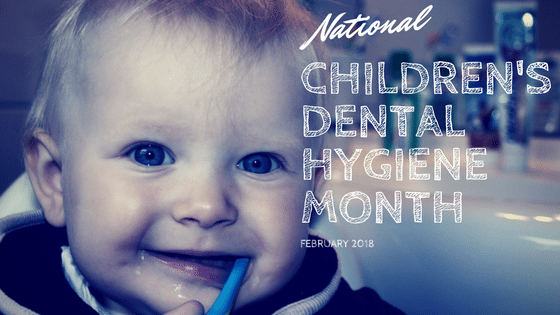 This month is all about children’s dental hygiene and we just want to share the information for you and your child’s benefit. If you have any questions at all, please feel comfortable calling our office to ask questions. We’re always happy to help. Now go brush those baby teeth!